Here's another Klira guitar for you, and it couldn't be more different than the example that Bertram posted on the blog yesterday. This particular Klira has obviously been modelled on the Fender Jaguar, but of course it is a much more modest affair without the fancy circuitry and much simpler hardware - check out that bridge for example, it could almost have come off a hollowbody jazz box. On first inspection the finish appears to be finely cracked with age, but it is in fact a vinyl finish with a deliberate snakeskin effect. It's not going to be everyone's taste, that's for sure, but I think it's cool. Note that the chickenhead pickup selector on the upper horn is original, whereas the other two chickenhead knobs for volume and tone are modern day replacements. I did think that was a tad too much in the chickenhead department there, it's like the guitar is trying just a little too hard to be retro. This guitar is currently being auctioned on eBay UK, with bidding at £21 at the time of writing. Auction ends next Sunday. 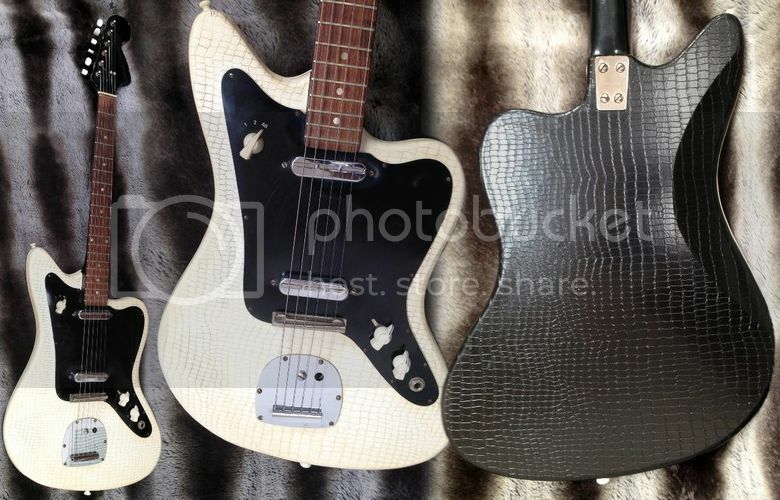 If it actually stays in tune and if it's not a too short scale it's truly a bargain; easy to change the pickups if they are too weak and a magnificent "snake skin" black and white finish. Hi! I've made a Rickenbaker 325 style guitar with a "snake" finish! Can send pics to you to post in the blog? Sorry for my english! I'm from Argentina. Greatest blog in the world! Thank you! I'll take some good pics to send!